An easy 7-minute stroll from Candolim Beach, Banyan Tree Courtyard is a small home stay offering air-conditioned rooms with a satellite TV. It features a restaurant and an outdoor pool. Featuring classic wood furnishings and four poster beds, the homely rooms come with private bathrooms, hot water and daily housekeeping. A work desk and ironing facilities are provided. 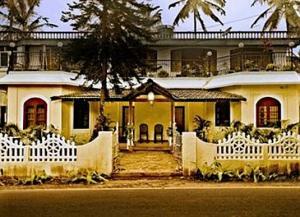 Banyan Tree Courtyard is 15 km from Panaji’s city centre and 6.9 km from the Church of Our Lady of Immaculate Conception. It is 7.7 km from Panaji Bridge and 18 km from Goa Dabolim Airport. A tour desk can arrange leisurely boat cruises down charming backwaters and airport transfers. There is also a business centre, laundry service and free parking. Hearty local and Western meals can be served in the casual open-air restaurant or in the privacy of guest rooms. Free! All children under 5 years stay free of charge when using existing beds. One older child or adult is charged INR 735 per night and person in an extra bed. Children's cots/cribs are not available. One child from 6 to 12 years is charged INR 565 per night in an extra bed. Maximum capacity of extra beds in a room is 1. Any type of extra bed or child's cot/crib is upon request and needs to be confirmed by the hotel. Supplements will not be calculated automatically in the total costs and have to be paid separately in the hotel.